There are 172 reviews of Prada Amber pour Homme. Prada Amber Pour Homme (2006) is the male counterpart to the reboot of the eponymous Prada perfume (2004), and originally went under the name Prada Man in some markets. Later, this formula was universally named Prada Amber Pour Homme, and had hands-on development from the granddaughter of Mario Prada and current head designer Miuccia Prada. In her own words, she said "I just tried to imagine what I would like if I were a man", and some of the perfume community inside jokes that followed include being made by a woman that secretly wants her man to smell like she does, and other such absurdities due to the fact that this scent is unsurprisingly not a macho stink juice. What is present in the rather classy bottle is a lilac-colored liquid which sits fairly square with the trends of the early 2000's: sweet, clean, sharp, soapy, mildly-aromatic and blended to the point of being nondescript. Prada Amber Pour Homme represents one of the earliest incarnations of the "sweet woody amber" genre that would later dominate the 2000's alongside the second wave of aquatics, laying to rest shrill ozonic citrus scents and fresh fougères still carrying over from the 90's. Most woody ambers from this decade had a touch of gourmand sweetness without going full-tilt gourmand like Thierry Mugler A*Men (1996), and Prada Amber Pour Homme is no different. The most prominent characteristic of this scent to my nose is the slight "grape accord" that I feel this lifted from Versace Man (2003), but took away from the sweet tobacco direction of that scent and moved into something drier and soapier. Overall, Prada would seem to have a love affair with soapy masculines in the same sense it does with candy-sweet feminines (literally having a scent named Prada Candy from 2011), and this soapy soiree starts here. There are a lot more published notes in the official documentation than what I detect, so I'm ignoring them. 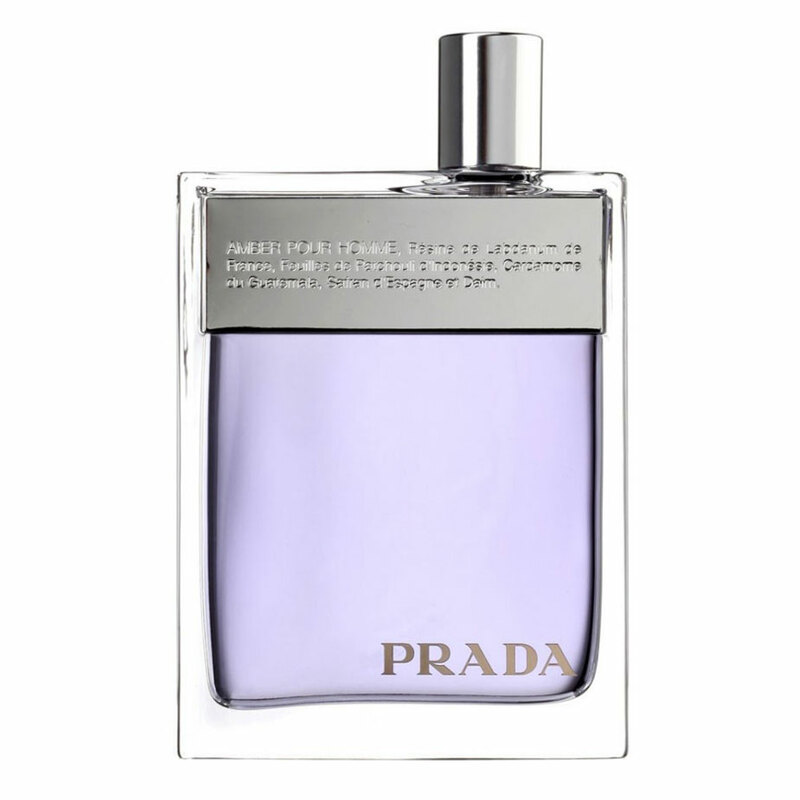 With that said, the opening of Prada Amber Pour Homme is mandarin, bergamot, cardamom, and a grape leaf accord which imparts the "grape drink" smell, although it's much less-evident than in Versace Man, and soon switches into something far different from that as the heart of pelagorium, vetiver, and neroli steer this into the soapy finish this juice is known for among most enthusiasts of the scent. Clean, fresh, and inoffensive without relying on any metallic aldehydes or aquatic notes is the way of Prada Amber Pour Homme by this middle phase, although I get very little actual amber from this so it is something of a hilarious misnomer to me as well. The base tries to fancy itself as a semi-oriental fougère hybrid with tonka, labdanum, vanilla, olibanum, and an early implementation of norlimbanol, which provides the somewhat scratchy and dry wood finish the perfumers list as "sandalwood". Norlimbanol would come to be fashionably overdosed in the 2010's, but here it slips under the noses of most since it is just blended in with the labdanum and olibanum so well to give that woody incense finish perfumer Daniela Andrier was likely after to help this find some masculine footing late in the wear. The overall accord is soft and almost like cotton candy at first, then it blossoms into that marvelous hotel soap before going into the modern aromachemical "woody amber" base that those familiar with 2010's iterations of the genre know all too well, but applied lightly with a deft hand as to not be annoying. I like and appreciate what Prada Amber Pour Homme does, but I don't understand the hype this scent at one time had, even if I do think it is a perfectly suitable signature for somebody looking to make an understated nearly gender-neutral entrance. Prada Amber Pour Homme feels very much built for the office or casual gatherings, and that is where I'll recommend this be used. Wear time is average for an eau de toilette, and sillage is moderate as per the trend of the decade. Guys who are staunch about their mossy green aromatics or heavy animalic spices need to look elsewhere, as this is clearly made for the heterosexual man of the "metrosexual" persuasion when it was fashionable in the late 90's through mid-2000's. As a gay man myself, the sky's the limit where gender in perfume is concerned and I find masculine-marketed perfumes from this period with such "faux-effeminate" leanings to be the equivalent of when Taco Bell facetious tries to pass itself off as authentic Latin cuisine in parts of America where the local yokels don't know better, but in that there is some naive charm so I end up liking it anyway. Besides, who doesn't love Taco Bell at 1am? In short, I won't fault the stuff for following the forms of its day. In the years removed from Prada Amber Pour Homme's release, there are a lot of things that do the "soapy clean dry" thing a lot better than this does, and without the grape opening to boot, but I still like this enough to want to smell like it more than once. Whether or not you think Prada Amber Pour Homme is still relevant in an over-crowded field of masculine scents that it helped create is up to you, but the newer Prada Amber Pour Homme Intense (2011) would ironically come across as a powdery and more-traditional take on the same idea for those not too enthused with the original's sexual ambiguity. One thing's for sure, with the hype having subsided, you no longer have to worry about smelling like everyone else if you sport this, which also may be an attractive selling point. Overall, Prada Amber Pour Homme is a badly-named and slightly unorthodox take on the classic dapper gent clean scent, with a bit of unisex appeal thanks to its "metrosexual" intent, in a gorgeous lilac juice-filled rectangular bottle adorned with an etched silver plate that looks attractive even next to much more-expensive niche brand packaging. Thumbs up! Prada Amber for men is a true jewel and as it is extremely long lasting, it creates a series of impression upon impression as it dries out. It is true that it is a little soapy, as some have suggested, but for me this is precisely the point, i.e. to smell nice throughout the day. Having said that, I believe that it is very discreet and a lot more discreet than Prada Infusion d'Homme, which is also a jewel and which is instantly recognisable and a lot more persistant. The ingredients are very well balanced. Mandarin and bergamot are there in the beginning, but you only notice them for a brief initial period. Patchouli, tonka bean and vanilla blend very well with vetiver and orange blossom at the end. Finally, I believe that Prada Amber for men is quite unique, as it does not resemble any other perfume. Prada Amber pour Homme seems to have an identity crisis when I wear it. For the first half hour or so, it's like an interesting variation on the Dior Eau Sauvage Parfum theme. After that, each time I catch it in the air, I will get one of two things - A nice manly, fresh, semi-spicy, earthy, balsamic blend or just straight up sweet baby powder and flowers. These two identities never seem to intersect, which is frustrating. Nothing about this fragrance smells bad or wrong and it is clearly well crafted and imaginative. There's a lot about it that I absolutely love but the love comes and goes in fleeting moments. I can't rely on you, Amber pour Homme, so I must leave you behind. I will take some great memories with me. No transition at all. Just straight up soap and soap. I felt pressured when I originally bought it and wasn't a big fan. Now, 6 years later, my taste has changed and I love it. Prada seems to always give Guerlain a run for its money when it comes to masculine powder scents. As many others have mentioned, this one is packed full of soap and powder. It really smells like a bar of soap found in a hotel. Longevity is great and the scent is completely linear. If you like it after the first spray, you'll be satisfied 8 hours later as well. Prada Eau de Toilette Spray 3.4 oz. 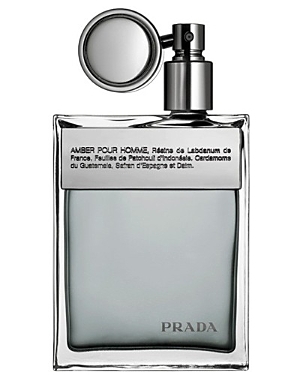 What is this dominate note/accord in Prada Amber Pour Homme that reminds me of Tabac original? Prada Amber Pour Homme; What's going on?! Prada Amber Pour Homme Worth The Hype, Consideration Still?